In the wake of the terrifying fifth assessment report (AR5) issued by the Intergovernmental Panel on Climate Change (IPCC), Bruno Latour’s latest book, An Inquiry into Modes of Existence: An Anthropology of the Moderns, makes a rather odd request: he asks his readers to stop, slow down, and reconsider the values of modernity. The book takes readers on a long journey to re-compose the understanding of what it means to be modern, with the goal that this evaluation will provide increased flexibility to confront the vastness of the ecological crises we are now faced with. This recent project can be seen as the flip side of We Have Never Been Modern, first published in French in 1991, which analyzed the ways in which modernity failed to live up to its own espoused beliefs, displaying, through painstaking detail, how modernity is constantly undone through its practices: that there cannot be, and has never been a unified project. In An Inquiry into Modes of Existence (AIME), Latour performs the “positive version” of the predominantly critical We Have Never Been Modern, conducting what he calls “an anthropology” of the moderns, seeking to understand the Moderns’ values while dissecting the epistemological assumptions behind them. In it he tries to fairly assess what might be worthwhile in our current institutional frameworks, in order to move from modernization to what he calls ecologization. This project is gleaned from thirty years of questionnaires and careful note-taking, asking people in the domains of politics, economy, organization, religion, and art to describe their practices. Instead of looking at these disciplines through their epistemological assumptions, Latour examines the details of everyday engagement, the ways in which meaning is created in the actions of practitioners. 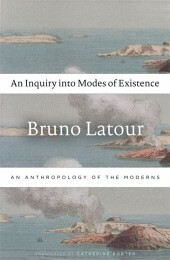 The subtitle, “an anthropology of the moderns,” is not incidental, but describes the ethnographic methodological approach underpinning the book, even as it reads as a “provisional report.” Extending the critique of science that Latour has been developing throughout his career into these multiple arenas, AIME systematically works through all of our major institutions to account for the breadth and depth of modernity, paying particular attention to the moments where these institutions intersect and overlap, in order to begin the difficult task of re-composing a new kind of collective project, under the name and terms of ecology, or Gaia. It won’t come as a surprise to readers familiar with Latour’s work that his main target, underlying all of the institutions that he examines, is the divide between subject and object, which has resulted in what he calls a “metaphysical famine” (148). This critical terrain has also been carefully explored by Frédéric Neyrat, another theorist in the ecological tradition who has clarified that it is not separation itself that causes the problem, the goal is not a relativist flattening within an immanent field. The problem arises with a definitive split, a position that makes no relation possible (besides that of the negative) between the subject and object. Latour’s philosophical project, drawing on the work of Étienne Souriau, Gabriel Tarde, Alfred North Whitehead, Gilles Deleuze, Isabelle Stengers and others, complicates this ontological division, without reducing everything to one smooth immanent plane, by examining the particular values of each domain. He reveals the ways in which both the idea of an autonomous Subject is completely untenable—a lonely, isolated, and bereft position—and that the reduction of Objects ignores and limits our perceptions of the world and the way that our attachments animate it. Latour turns to the term “modes of existence,” borrowed from Souriau, to express ontological plurality beyond this reductive division. Modes of existence expresses, and classifies the multiple ways of addressing worlds. Each being must be addressed from within its own singular language, and respected within its modality. Modes of existence posits a pluralist ontology where “A mode of existence is…always both a version of BEING-AS-OTHER (a debiting of discontinuity and continuity, difference and repetition, otherness and sameness) and also its own regime of veridiction” (Latour 183). In other words, a mode of existence contains a consistency unique to itself, but one which constantly borrows from, is crossed over and into by the other modes, creating the generative possibility for dynamic change. And it is by tracing these crossings, using Actor-Network-Theory (ANT) methodology, that the scope of the project of modernity becomes apparent. The philosophical premises of the book asserts a radical activity of the world itself, insisting on the plurality of the worlds which need to be addressed. Latour takes this demand of animacy seriously, asserting that, “It is the world itself that is articulated” (256, emphasis in original). By this he means that the world lends itself to a kind of narrativity, a metaphysical orientation in which it produces its own characters, its own actions, a vitality of the world that cannot be reduced to this simple binary. From this position one can see the political orientation of the project: if the world demands to be articulated then the stories we tell ourselves about the world fall into the realm of ethics. How can we begin to tell different stories in order to address the catastrophic ecological times we find ourselves within? To answer this question Latour returns to a rather old-fashioned mode: diplomacy. Diplomacy assumes that we need to re-negotiate the terms of self and other within each mode of existence, to see the value in each mode, even if we cannot take on its epistemic assumptions. For example, we need to respect the beings of religion, the attachments that religion calls for, without necessarily taking on a transcendent God. I call this turn old-fashioned because in a time when cities and municipal governments seem to be at the vanguard of ecological policy-making, Latour returns to the motif of a global war where the stakes and claims of each side need to be articulated clearly in order to set out on a new course. To a large degree this seems like a perfectly legitimate plan of action. It is clear that the catastrophes that we now face really do call for a new sort of globalization, or ecologization, but given that international committees, specifically the IPCC, have been attempting these negotiations since 1988 with few policy results, or results that are far outweighed by their failures, this seems an odd turn. Yet the diplomat—the one who is as devious as they are naïve—is a central figure for Latour. Latour vehemently identifies the economy as the real stumbling block to any negotiation under the present terms. He asks, “can the Moderns finally become agnostic where The Economy is concerned?” (470). Latour identifies the ways in which the economy has ascended to the immovable and ahistorical position that Nature used to occupy, whereas nature, under the weight of the Anthropocene, is now thoroughly historical and in a constant state of transformation. But, if it were possible to shift our position towards the economy, perhaps the dream of diplomatic relations might become a possibility. The question remains how to proceed. That the larger project of AIME consists of an online platform where people can access the book (together with notes, bibliography, index, glossary and supplementary documentation) and can also upload contributions constitutes an attempt to enact these diplomatic relations. Recognizing the necessity of moving beyond the Internet, the project also incorporates face-to-face meetings with ‘co-investigators’ to bring together practitioners of the modes of existence that the project addresses. Here the contradictions begin to become apparent, not necessarily in the thought itself, or within the parameters laid out by the book, but in terms of the place of academic literature in relation to political, or diplomatic procedures. Asking readers to take on the task of reading and understanding an imposing book embedded in a particular philosophical tradition and then to meet Latour on his terms in order to begin the difficult task of forming a collective capable of facing Gaia brings up the question of the adequacy of traditional academic venues for such political projects. As Piya Chatterjee and Sunaina Maira suggest in their new book The Imperial University: Academic Repression and Scholarly Dissent, the university is often a far more conservative institution than we might like to think—perhaps not the best place from which to launch political negotiations. What new languages and modes of existence need to be created in order for us to influence the political regimes that we are interested in? And wouldn’t this type of project need to be built from the point of view of the practitioners from the beginning? And if this work seems rather far-fetched, what kinds of institutions should we be investing in, if not academia, in order to begin to enact the kind of change that we imagine? Latour’s project may fail to even begin to achieve its stated goals, lofty as they are, but the value can be seen precisely in the questions that it leaves behind with the reader, especially for those of us invested in, or caught by academic institutions. Certainly, Latour is far from naïve about the ambition and feasibility of the project he proposes in AIME: “[Y]ou have to be idiotic to throw yourself into something like this, no question, but this sort of idiocy is a stage that may not be superfluous, if it serves to open up a space between experience and its institutional rendering” (480). The haunting thought that it leaves behind is that this gesture may not have come soon enough—our thought, politics, and modes of existence are both too fast and too slow in the terms of the earth. Ahmed, Nafeez. “Nasa-funded study: industrial civilisation headed for ‘irreversible collapse’?” The Guardian. Web. 14 March, 2014. Chatterjee, Piya and Sunaina Maira, eds. The Imperial University: Academic Repression and Scholarly Dissent. Minneapolis, MN: University of Minnesota Press, 2014. Print. Intergovernmental Panel on Climate Change. Climate Change 2013: The Physical Science Bias. Web. September 1, 2014. —–. Climate Change 2014: Impacts, Adaptation, and Vulnerability. Web. September 1, 2014. Johnson, Elizabeth and Frederic Neyrat. “The Political Unconscious of the Anthropocene.” Society and Space – Environment and Planning D. Web. March 20, 2014. Latour, Bruno. We Have Never Been Modern. Trans. Catherine Porter. Cambridge, Mass. : Harvard University Press, 1993. Print. Souriau, Étienne. Les différents modes d'existence. Paris: Presses Universitaires de France, 1943. Print. AIME operated from 2012 until July 2014. The project, including the website and international consultations, has since closed. Heather Davis is a researcher and writer from Montreal. She is currently a Postdoctoral Fellow at the Institute for the Arts and Humanities at Pennsylvania State University. She researches the intersection of art, politics, and environmental catastrophe. She is the editor of Art in the Anthropocene: Encounters Among Politics, Aesthetics, Environment and Epistemology (Ann Arbor: Open Humanities Press, forthcoming). Her collected writing can be found at heathermdavis.com.